Universal Technology Solutions P/L is really to announce that we have finished the web project for orthopaedic hip and knee surgeon sydney, australia. We have re-developed the old website into CMS system and it is published live in this month August 2016. Lets discuss how it was developed before and what changes we did while re-doing the new website. Initially, it was done in WIX template, and hosted on Wix, not updated for some time. 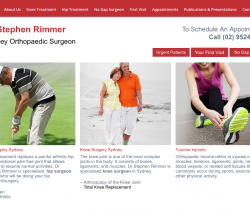 It helped Dr Stephen to make his online presence and describe his services towards his specialise Hip Surgery Sydney and Knee Surgery Sydney. We have used Wordpress CMS to develop this website.